A legal battle is brewing between the managers of a mobile home park and an 85-year-old Florida woman who put in a painting of the Virgin Mary to replace her window. 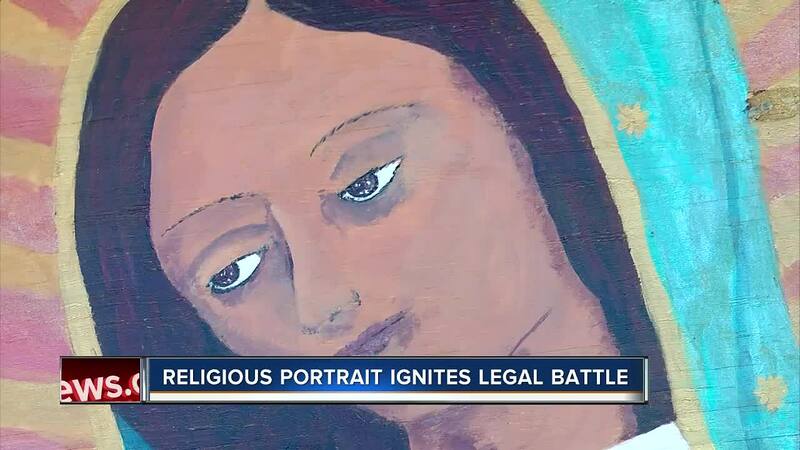 BRADENTON, Fla. — A legal battle is brewing between the managers of a mobile home park and an 85-year-old Florida woman who put in a painting of the Virgin Mary to replace her window. Millie Francis said the portrait of the Virgin Mary as Our Lady of Guadalupe was supposed to bless her mobile home. Now it's at the center of a legal battle. "The issue is religious and personal," she said. She got the idea to put replace her front window with the portrait -- made out of plywood -- after communion. "On my way back a name just said our Lady of Guadalupe, and I said that's what it's going to be," she said. The Bradenton Tropical Palm's Board of Directors said it's against their rules. Management gave her approval to remove the window, but said she did not tell them about replacing it with the portrait. "I'm devastated," Francis said. "Ride around the park and look at a lot of the others are framed in completely with Mickey Mouse, dolphins, you name it." ABC Action News did tour the rest of the mobile home park. Several others did remove their windows, but they covered them with siding, and put decorations on top of them, like Jerry Waid. "If you're going to take your window out you have to cover it, or put the same size window back," said Waid. "You can't just cover it with plywood." ABC Action News reached out to management for comment about the rules. They told us to contact their lawyers. Francis just turned 85, and said she's not backing down. She went through a similar situation after she put a garden in her backyard. She said she's going to fight for her portrait like she did then. "It's going to stay," she said. "It's already been blessed, and it's staying right there."